Here are more photographs on the occasion of Muharram, which is observed to commemorate the martyrdom of Hazrat Imam Husain and his companions. The photograph of Shia Muslims performing 'Maatam' below is from Amritsar, once a City with half of its residents being Muslims. But after partition, almost entire Muslim population of Amritsar moved out. Over the last few decades, the urban areas in Punjab have seen a growth of Muslim population. Most of the migrant workers from Bihar, UP and other parts of India are now settled in cities like Ludhiana, Jalandhar and Amritsar. As a result, there is a revival of Islamic observances in Indian Punjab. Till recently, only Maler Kotla pocket in Sangrur district had a concentration of Muslims. It is in this context that maatam by Anjuman Yadgar-e-Husaini at the Imambada in Amritsar holds special significance. The other photographs include that of the famous 'Bibi ka Alam' in Hyderabad Deccan. The procession is taken out annually on Yaum-e-Ashura. There is a huge crowd of mourners from both Shia and Sunni sects who attend this observance. 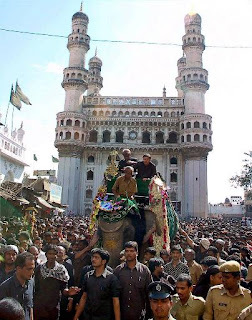 Hyderabad is a centre of Muslim culture in South India. Photos of fireworks during Muharram are from Jamshedpur in Jharkhand province. The photograph of Tazia is from Ahmedabad, which is the capital of Gujarat state. 'Tazia-daari' is an age-old custom in entire Indian sub-continent. An eight-year-old Hindu boy, Manish Kumar, walks on red hot embers in Lucknow. Many Hindu families perform Azadari. 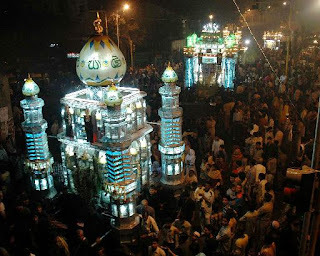 Muharram is a period of mourning and it is observed, NOT CELEBRATED. In India, Hindus and other religious communities also take part in the rites and rituals. Imam Husain, the grandson of Prophet Muhammad, had achieved martyrdom at the battle of Karbala, while fighting against the army of the evil Yezid, in seventh century in present day Iraq. Ever since, the martyrdom is being commemorated across the world. Shias whiplash themselves to express their sentiments. Sunnis on the other hand take out tazias. In Indian sub-continent, the uniqueness lies in the fact that Hindus also take out tazias [ie the replica of Imam's tomb]. They also organise distribution of the sherbet or tabarruk [holy food]. 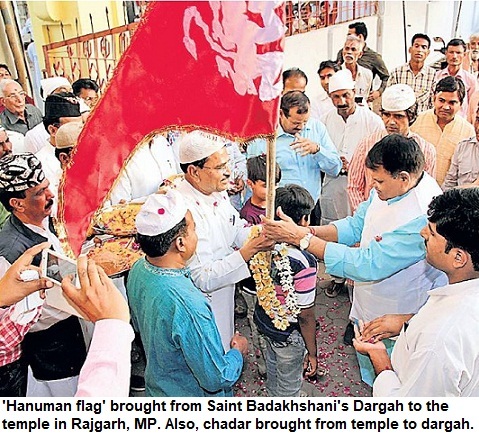 Read the story about such tradition and 'Hindu Imambaras' in DNA.